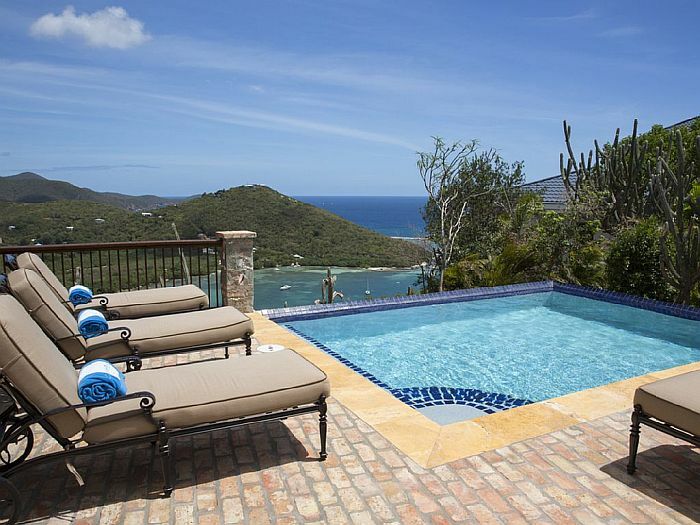 Caribbean Palm Villa is a 3 bedroom, 3.5 bath Villa with a pool and spectacular 270 degree views in a Mediterranean/Tuscan/Caribbean setting, conveniently located in prestigious Point Rendezvous on the south shore less than 5 minutes out of Cruz Bay. 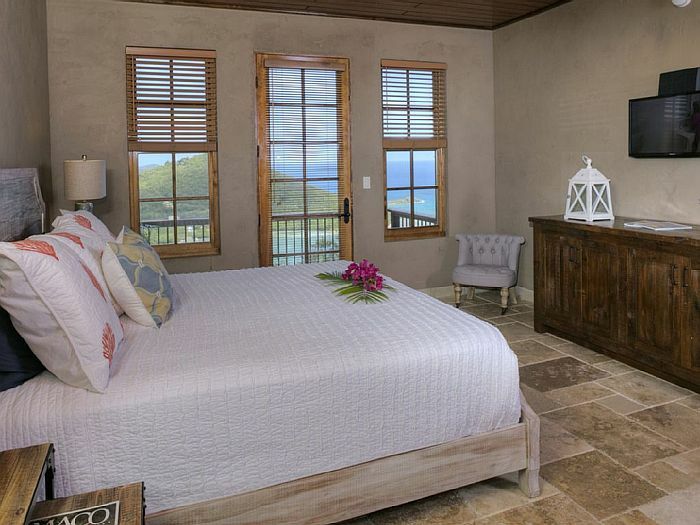 Built in 2015, this Rendezvous Bay Villa, features three master suites all with ocean views and private balconies. 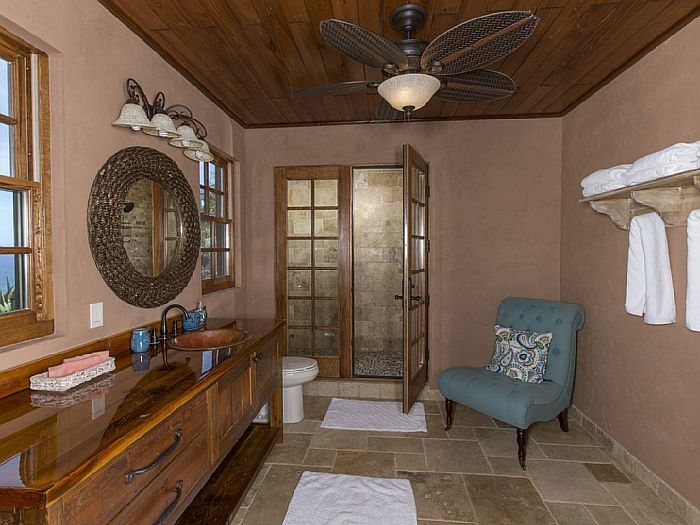 Each master suite is equipped with an en-suite bath and private out door shower which also have ocean views. The 810 sq ft of covered veranda with constant 24/7 trade wind breezes and 3 bay view, is a simple one step down from the great room. The pool and the 800 sq ft pool patio for sunning and relaxing finished with genuine Chicago Pavers, is just one step down from the covered veranda. The covered veranda which wraps the villa on 2 1/2 sides allows you to enjoy the 270 degree views with out the sun or rain forcing you indoors. 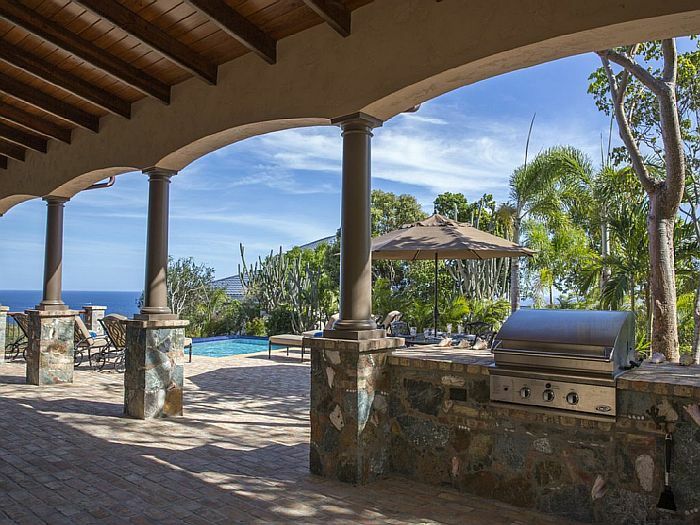 There is a built in grill, set in the native island stone work, located on the veranda close to the kitchen and the pool. The 810 sq ft of covered veranda with constant 24/7 trade wind breezes and 3 bay view, is a simple one step down from the great room. The pool and the 800 sq ft pool patio for sunning and relaxing finished with genuine Chicago Pavers, is just one step down from the covered veranda. The covered veranda which wraps the villa on 2 1/2 sides allows you to enjoy the 270 degree views with out the sun or rain forcing you indoors. 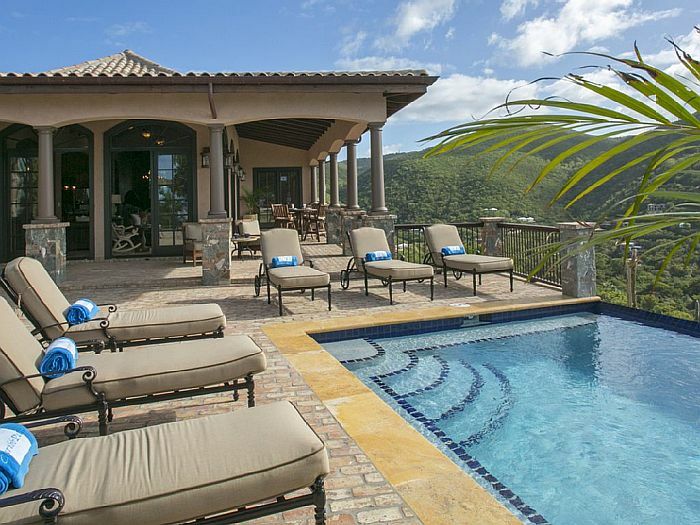 There is a built in grill, set in the native island stone work, located on the veranda close to the kitchen and the pool. All rooms, including bedrooms, are accessed by an interior staircase which is much safer for guests with small children. There are cots available for additional guests. The first floor has one of the three master suites, kitchen, great room, laundry and a powder bath. 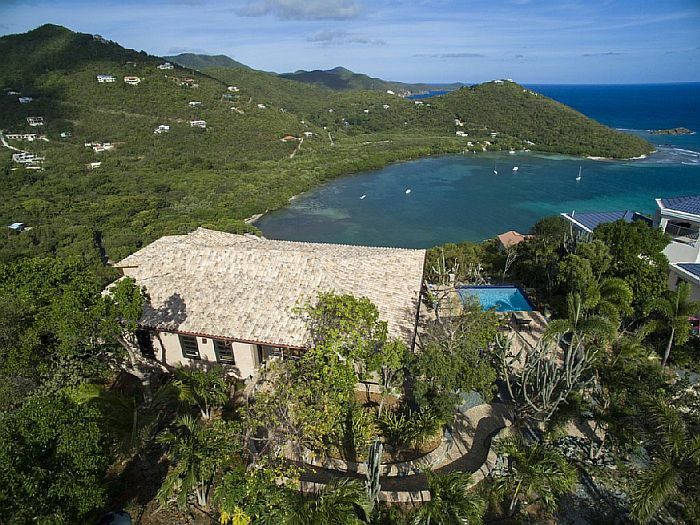 The villa offers WiFi, satellite TV, fully-integrated audio system with indoor & outdoor speakers, beach chairs, coolers and purified water through out the villa. The gourmet kitchen also features ocean views, granite, stainless steel appliances and is fully stocked with cooking utensils to insure you will have every thing you need to cook your favorite meal. 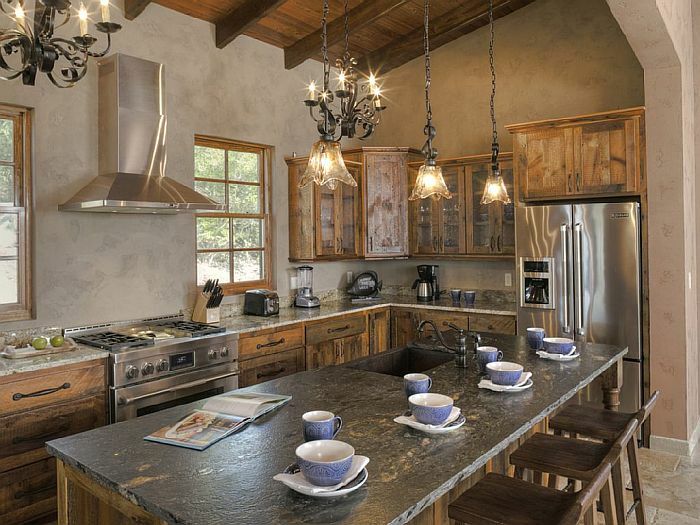 Even the kitchen has multiple bay views. Farm house copper sink sits in the middle of the 4×8 island. UV purified water. Gas Range. 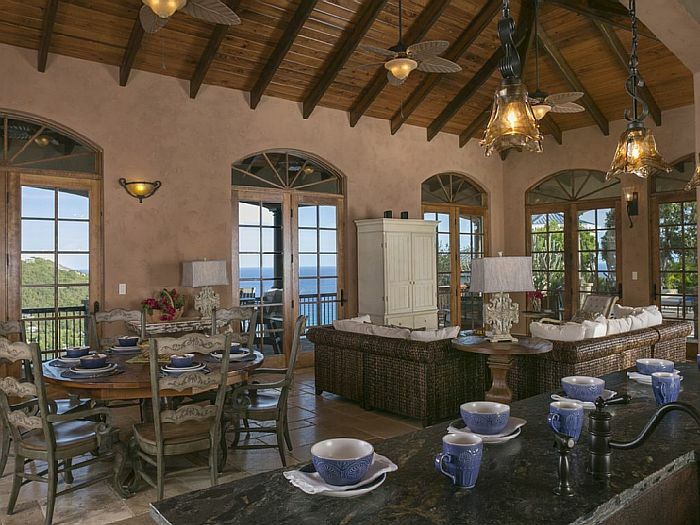 Just off the kitchen is the great room with 18 ft vaulted tongue and groove cypress ceilings and the Caribbean Sea beyond. 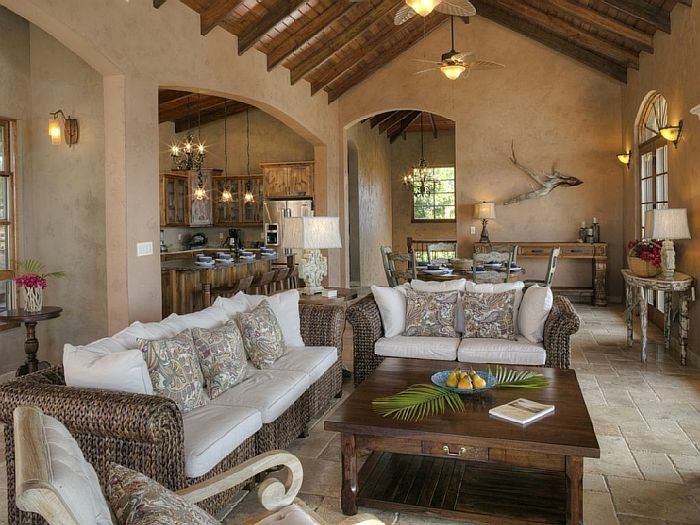 Lounge in the great room and enjoy the view over Fish Bay and Rendezvous Bay through the many 10 ft French doors that wrap the great room on two sides. The decor of the villa is an elegant yet a but rustic theme which would mimic a Mediterranean/Tuscan villa that has met the Caribbean. 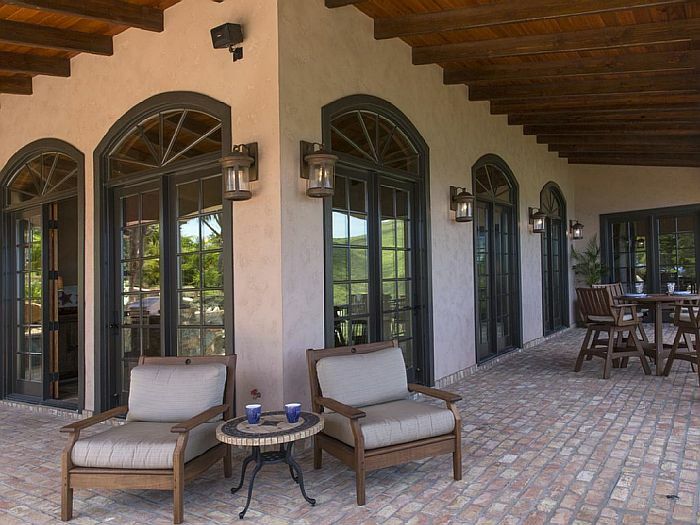 Travertine floors, tongue and groove cypress ceilings with exposed beams, Reclaimed Chicago Brick Pavers on the veranda and pool patio, and reclaimed barn wood custom cabinetry. All doors in the villa are eight feet reclaimed barn wood as well. Vintage vanities with high end finishes in each room. The dining area is part of the great room area just off the kitchen. 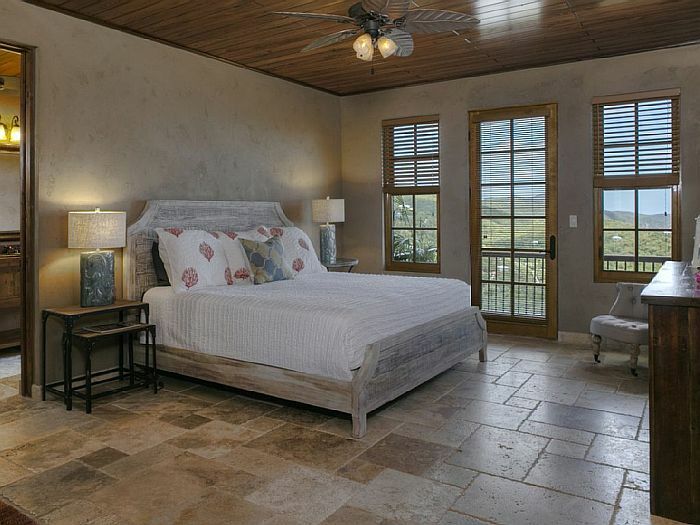 This room is surrounded by french doors on two sides with 18 ft vaulted ceilings. 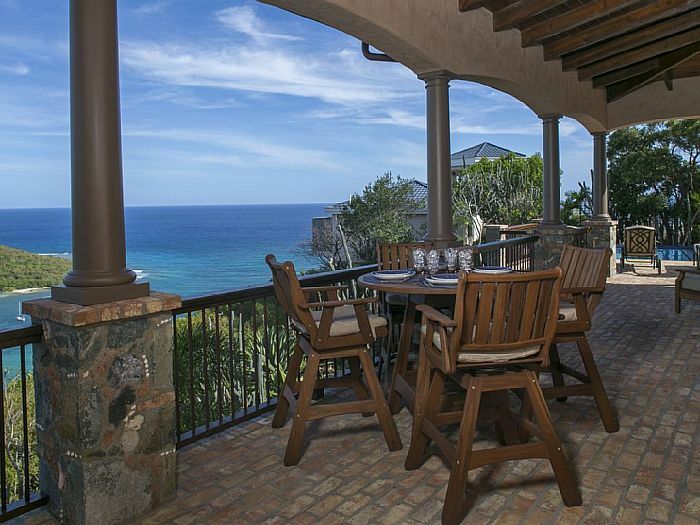 Enjoy dining with an ocean view! 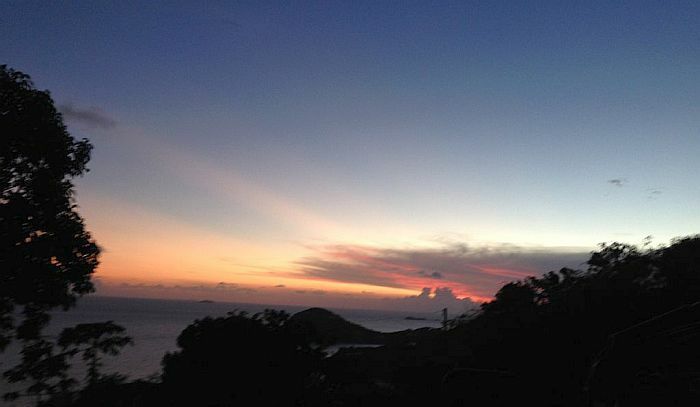 Sunset view from covered veranda facing south west looking over Rendezvous Bay. 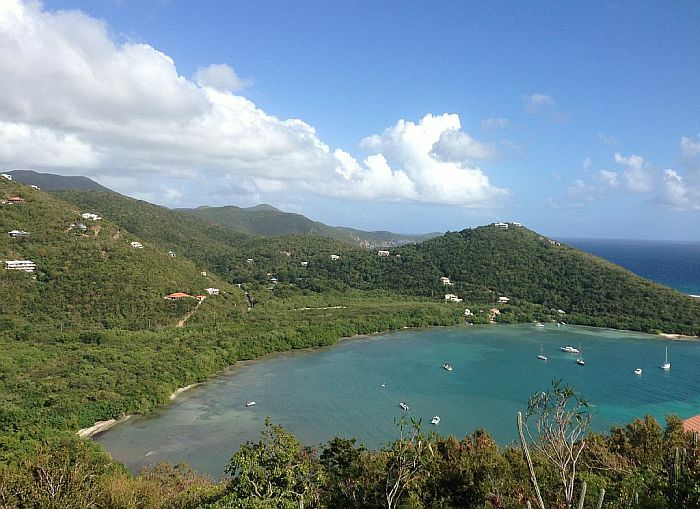 Beach View: Our location and elevation not only offers the beautiful colors of Fish Bay but we are also able to see the sandy shoreline. 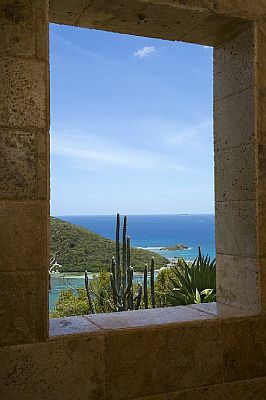 Ocean View: Caribbean Palm offers panoramic 270 degree 3 bay views, Reef Bay, Fish Bay and Rendezvous Bay AND the Caribbean Sea beyond. 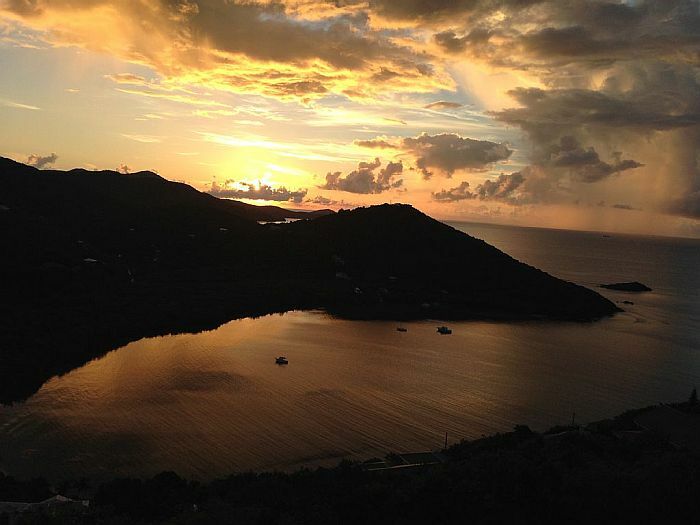 Our view also includes St Croix in the distance. Hotel tax of 12.5% is not included. $50.00 non-refundable Security Deposit required. Out door dining with ocean views. 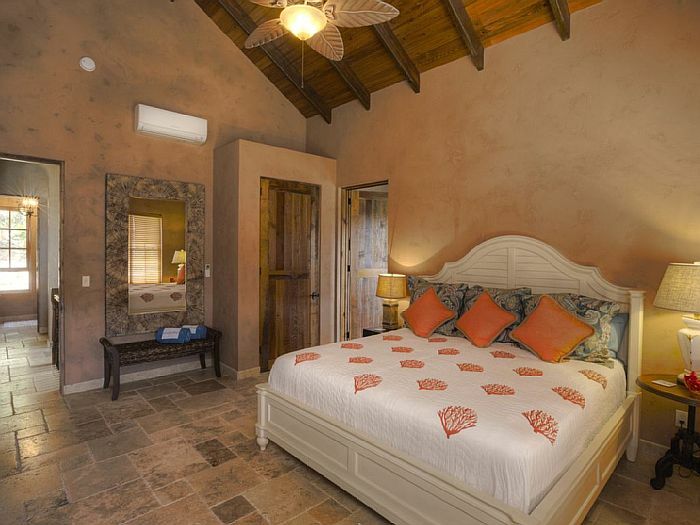 All bedrooms are air-conditioned with whisper quiet units. 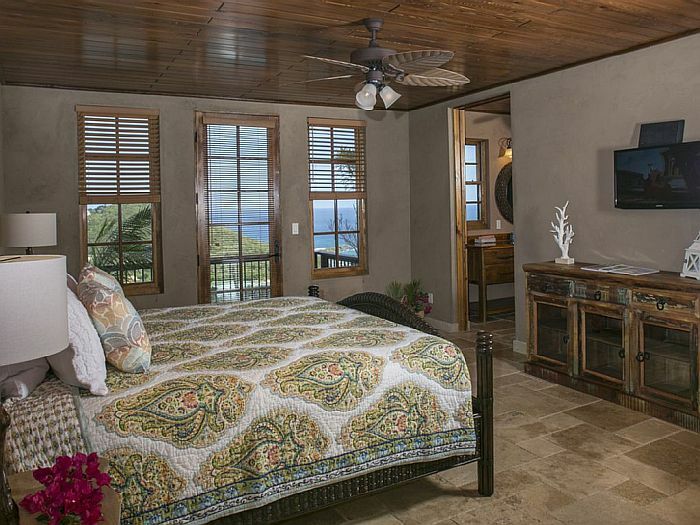 Caribbean Palm Villa features 3 master suites all with ocean views, private balconies, satellite television and ceiling fans. 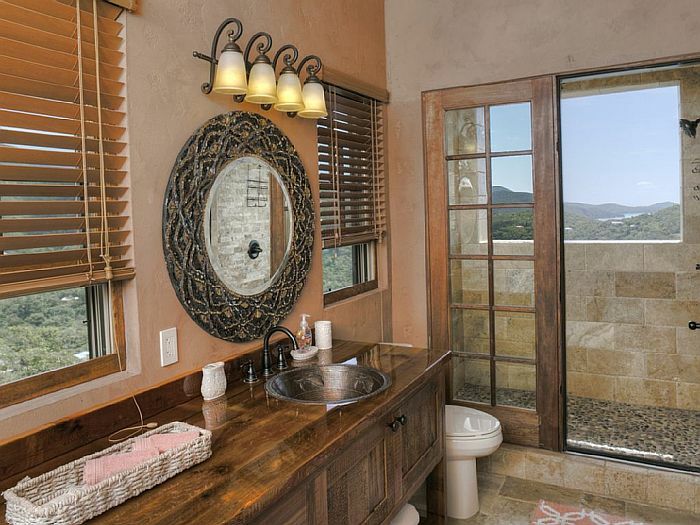 1 of 3 master baths with outdoor showers. 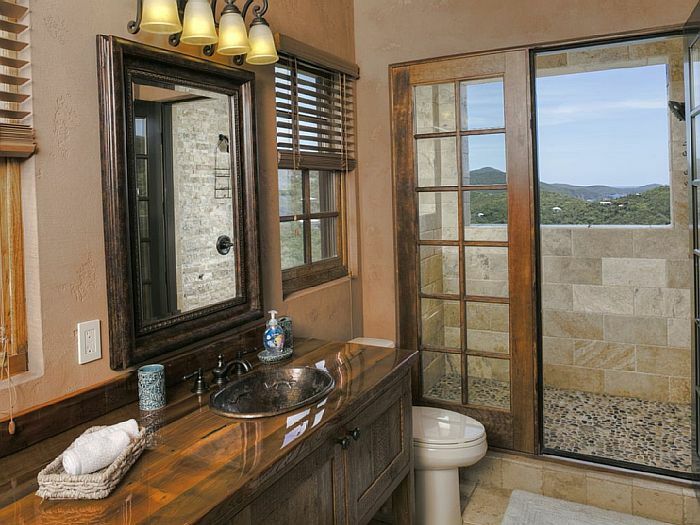 Each master suite is equipped with an en-suite bath and private out door shower with ocean views. Three equal-sized master bedrooms each with AC and king beds will guarantee that each guest has a wonderful room – all with bay and ocean views. 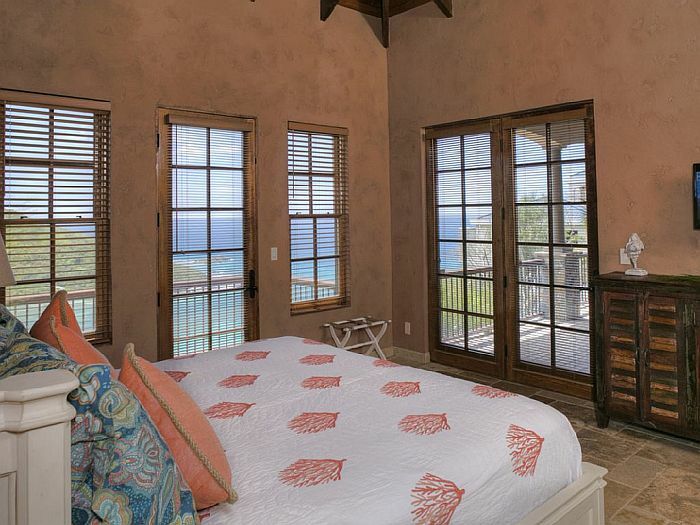 Air-conditioned Master Suite with an Ocean View off the balcony. Access is very easy just off the South Shore road. our driveway/parking area is flat and there are only 2 stairs to gain access to the villa. 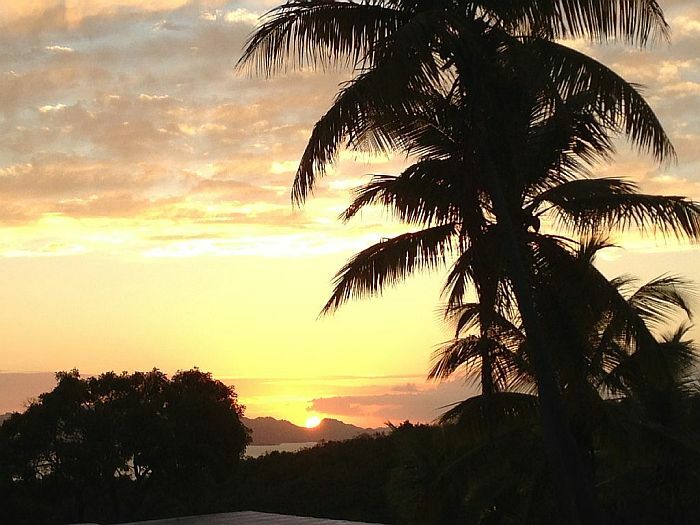 Come to Caribbean Palm Villa and enjoy all that St John has to offer.